Vafe is the northern region of Auridon. 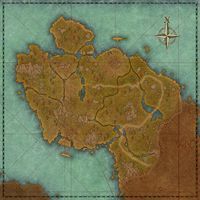 It extends from the Bewan, Dawnbreak, and the College of Aldmeri Propriety in the south up to the northern tip of the island. The city of Firsthold is in the northern area, and the Vafe Dolmen is just south of that. The region of Calambar is to the south. The Banished Cells I — A group dungeon found at the northern tip of Auridon. The Banished Cells II — A group dungeon found at the northern tip of Auridon. These side quests count towards the Auridon Adventurer achievement. For Dominion storyline quests which also contribute to this achievement, please see Auridon Quests. Blessings of the Eight: Help the Torinaan clergy cleanse their holy sites. The Jester's Joke: Help reunite a spirit with his soul. Relic Rescue: Help the relic-keeper protect Torinaan's priceless artifacts. Rightful Inheritance: Help the illegitimate son of a High Kinlord prove himself to his ancestors. Burn the Veil 5 Defeat the Daedric army and their leader at Firsthold. This page was last modified on 20 June 2018, at 19:14.